It took nearly two hours to restart Fabrice Muamba's heart after he collapsed in cardiac arrest on the pitch, it has emerged as he remains in a "critical condition". The hospital treating the Bolton midfielder after the shocking collapse during a live televised FA Cup tie has said the footballer remains in intensive care. The 23-year-old's status was announced in a joint statement by staff at the London Chest Hospital and his team, Bolton Wanderers. The statement confirmed that Muamba had suffered a heart attack on the pitch at 6.11pm during his club's sixth round match against Tottenham Hotspur. There were no players around him at the time. It told how medics fought to save him for an extended time on the field and had to continue the battle for his life on the way to hospital. Muamba's heart finally started working when he reached the London Chest Hospital at 8pm. He has since been anaesthetised in intensive care and doctors say he will remain that way for at least 24 hours. The game, at Tottenham's White Hart Lane stadium, was being watched live by millions of television viewers around the world on Saturday evening. Together with 36,000 fans in the ground, they watched in horror as medics struggled to bring Muamba round. Outside the hospital during the night, Bolton manager Owen Coyle said the next 24 hours would be "absolutely crucial" and urged people to pray for the player's recovery. He told Sky News: "We've obviously been inundated with people wishing him well and we hope that if everybody can pray strongly tonight that Fabrice is able to recover. "It's very serious. There's no getting away from that. He's critically ill and God willing he makes it through." Bolton said in a statement: "(We) can confirm that Fabrice Muamba has been admitted to the heart attack centre at London Chest Hospital where he is currently in a critically ill condition in intensive care. "No further information will be issued at this stage. The club has requested the media to respect his family's privacy at this time." Muamba collapsed suddenly as the game was approaching half time. The crowd fell silent as Mr Coyle ran on to the pitch to see what had happened. He could be heard shouting: "He just collapsed!" Shocked players looked on in disbelief as the former England Under 21 star was treated with a defibrillator for several minutes before being stretchered off wearing an oxygen mask. World Cup referee Howard Webb abandoned the game with the score at 1-1. As the message was relayed around the stadium fans applauded and chanted Muamba's name before solemnly filing out of the stadium. Premier League chief executive Richard Scudamore said: "The thoughts of the Premier League, its clubs and players are with Fabrice Muamba, his family and Bolton Wanderers. "We would like to praise the players, match officials, coaching staff and medical teams of both clubs at White Hart Lane for their swift actions in attending Fabrice. "The league would also like to commend the compassion shown by the fans of Bolton Wanderers and Tottenham Hotspur." Bolton's match against Aston Villa on Wednesday has been postponed. Muamba was born in Zaire (now the Democratic Republic of Congo) and came to Britain as a political refugee. He has also played for Arsenal and Birmingham City. On his Twitter account he describes himself as the "proud dad" of Joshua Jeremiah. He became engaged to girlfriend Shauna Magunda on Valentine's Day. Before the match Muamba took to Twitter to express his excitement over the tie. Using the username @fmuamba, he tweeted: "Just reach white hart lane. #COYW lets have it now." Other Premier League footballers posted messages on the website after his collapse. Arsenal and England midfielder Jack Wilshere, who played with Muamba at Bolton, wrote: "Hope Muamba is okay. Thoughts with him." Manchester United star Rio Ferdinand wrote: "Come on Fabrice Muamba, praying for you." England striker Wayne Rooney wrote: "Hope fabrice muamba is ok. Praying for him and his family. Still in shock." Muamba's team-mate Stuart Holden, added: "Still praying for Fab, the guy is a fighter on and off the field. We love you bro." Tottenham forward Rafael Van Der Vaart, who was on the pitch when Muamba collapsed, wrote on Twitter: "Terrible what happened with Muamba during the game. We're all praying for him." Former football manager and pundit David Pleat, who was watching the game, said Muamba's arms were seen to "jerk", which he described as "terribly traumatic" and "eerie". He said Muamba, who played for England all the way through Under 16s to Under 21s, was a good athlete. Mr Pleat said players were tested rigorously for heart and other problems frequently, adding: "But these things can be genetic and you never know. "The only thing that makes us sit up and think tonight is there are many things more important than football and what's happened tonight is far more important than football." I think most of the UK has remembered Fabrice in their prayers today. A 21-year-old man has been arrested after racially offensive Twitter comments were made about footballer Fabrice Muamba, who collapsed after suffering a cardiac arrest during an FA Cup tie. He is being held at Swansea Central police station, South Wales Police said. The comments appeared on the Twitter account @liamstacey9, which has since been taken down. While the feed was still visible comments claimed that his account had been hacked. Other users of the micro-blogging service responded with outrage to the remarks. Muamba, 23, was rushed to hospital after suffering what appears to have been a heart attack on the pitch before 36,000 horrified spectators last night. He is currently in critical condition in hospital. Note, Law Enforcement didn't need a court order to obtain the offender's name or location. Wow. 23? It's even more shocking because you think of a footballer as being in top shape, let alone being only 23 and having a heart attack. Here's hoping he makes a full recovery. lily wrote: Wow. 23? It's even more shocking because you think of a footballer as being in top shape, let alone being only 23 and having a heart attack. Saw it last night on the Mexican news, lily. It has shocked many in the soccer world. That didn't take long, did it. You can understand why, Tony. This has happened once or twice before with footballers, Lily - if it is the same condition, it is an almost-undetectable heart problem that people are unaware of until it strikes. Fingers crossed, Febrice will pull through, as he got attention almost instantly, but the others have not made it, sadly. Tottenham Hotspur players have demanded they be checked for heart problems in the wake of Fabrice Muamba's collapse during the side's clash with Bolton Wanderers, it has emerged. Consultant cardiologist Sanjay Sharma, who had coincidentally been due to carry out routine checks of one or two players this morning, told Sky News the whole team now wanted to be screened after witnessing the 23-year-old footballer's cardiac arrest. Prof Sharma said the players had made the decision after the "shocking scenes" they saw at White Hart Lane at the weekend. It comes amid calls for all young athletes in Britain to be screened for genetic heart problems and continuing questions about what caused Muamba's heart to stop. Some experts want Britain to follow the example of Italy, where all young athletes have compulsory heart checks and there has been a 90% drop in similar incidents. Muamba, who remains critically ill, has significantly greater chance of recovery thanks to the medical team that rushed into action when his heart stopped during the FA Cup clash on Saturday, according to Dr Graham Stuart, medical director of Sports Cardiology UK. The cardiologist said the quick work of paramedics and doctors would have been crucial to limiting damage to the player's organs. "The sooner they were able to get him breathing again the better," he said. Dr Stuart said the hospital team would now be doing as much as they could to support Muamba's organs. "At this stage doctors would be looking to get oxygen back to the brain." The incident has rocked the football world, with many asking how someone so apparently healthy could suffer cardiac arrest. But it is not the first time a footballer has suddenly died from heart problems. In 1995, John Marshall, a 16-year-old footballer from Lancashire, died the day before he was due to sign for Everton Football Club. In June 2003, Cameroon footballer Marc-Vivien Foe died after collapsing with a heart attack during an international match in France. The 28-year-old was treated on the pitch before being stretchered off and receiving further treatment, including mouth-to-mouth resuscitation and extra oxygen. Medical staff tried to restart his heart for 45 minutes but without success. 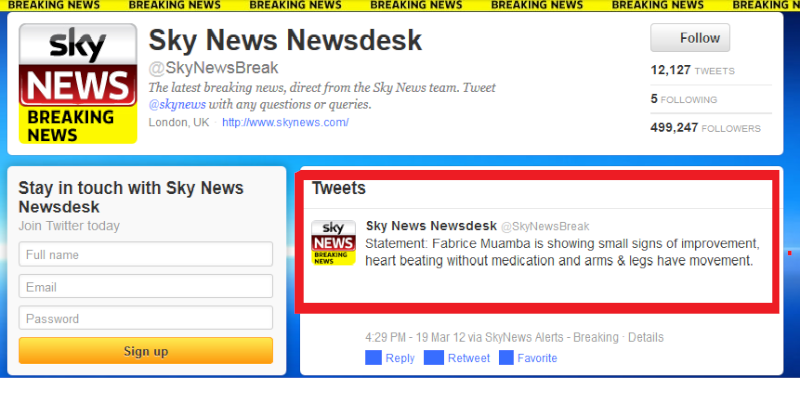 It remains unclear exactly what caused Muamba to go into cardiac arrest, which is different from a classic heart attack. Cardiac arrest causes a chaotic rhythm, or the heart to stop completely, while a heart attack is typically a much slower process caused by a blockage in the blood supply to the muscular heart wall. Some have pointed to the condition known as Hocum - or hypertrophic obstructive cardiomyopathy (HOCM) - which is caused by a genetic abnormality that causes the muscle of the heart in well-exercised people to grow much thicker than it should. That can stop the normal flow of blood coming in and out of the heart. The risks to footballers have been known for many years. At present in the UK, all junior footballers from the age of 16 to 17 undergo screenings, but British clubs do not have to screen players after that. Dr Stuart cautioned such checks meant some athletes in Italy were needlessly banned. "It has worked in so far as there has been a 90% reduction in these incidents (in Italy)," he said. "It is a controversial ruling, however, because there is scope within it for players to be banned from competing when the likelihood is that they would not be affected." He added: "Every year, these things unfortunately happen in sport. It is not the sport that is the problem but rather the abnormality that causes it. "It is quite possible this could have happened in any other sort of exercise." Experts have been keen to point out that cardiac arrests in healthy young people are rare and the health benefits of taking part in sport outweigh the risks. But the Cardiac Risk in the Young charity, which provides screening services for several footballing bodies, has said 80% of apparently healthy 14 to 35-year-olds who die from cardiac issues will have shown no previous sign of heart defects. Some positive news, but still critical and long term still unclear. Oh, that is good news, Rose - fingers crossed, he will pull through, thanks to getting emergency treatment almost at once. Thanks, Tony - people all over the world are thinking of him, aren't they? bb1 wrote: Thanks, Tony - people all over the world are thinking of him, aren't they? What is odd that it is actual football - I think it's called soccer in the States, Tony? - that seems to be most afflicted by this heart problem that comes almost out of the blue. I am so glad the medics at the side of the pitch acted so quickly. There was actually a Cardiologist at the match. You know, like what Gerry McCann is. And it has been said that his prompt action went a long way to save the young man's life. But apparently the Forkers would rather die. Good Lord, Rose, I didn't realise there had been as many as that, or that it had been known about for so long. Fabrice is breathing unaided now, and responding to his family. Nice to have some good news for a change. Bolton Wanderers fans unveiled a mosaic tribute to footballer Fabrice Muamba at the team's first match since he collapsed a week ago. Minutes before kick-off in their relegation battle with Blackburn Rovers, supporters raised placards in the Nat Lofthouse Stand of the Reebok Stadium. The huge message of support read "Muamba 6", a reference to the 23-year-old player's Bolton squad number. He remains in intensive care at the London Chest Hospital after falling on the pitch from a cardiac arrest in the 41st minute of Bolton’s quarter-final tie against Spurs at White Hart Lane. His heart stopped for 78 minutes, but a chain of club doctors, emergency paramedics and cardiologists managed to keep him alive. A photograph of footballer Fabrice Muamba sitting up next to his hospital bed has been posted on Twitter as he continues to recover after suffering a cardiac arrest during an FA Cup tie. "Fab wanted me to post this pic for you all and to also say thank you for such overwhelming support," the message accompanying it read. Great news. Here's hoping he makes a complete recovery.